This is for this week's Cinema Saturday Creative Challenge: Crouching Tiger, Hidden Dragon. I didn't know this movie before, so I ordered it and received it on Wednesday - just in time to create a card for the challenge. I was very impressed of the whole movie. It was totally different from what I expected. Almost no blood and cruelty, but beauty everywhere: the dresses, the swords, the architecture, the landscape. For my card, I used an Asian landscape which I stamped with Palette Noir ink onto watercolor paper. 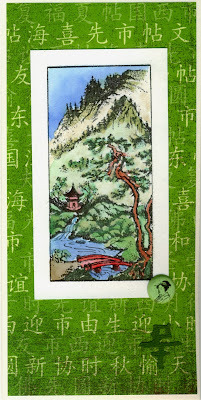 I watercolored the image with Twinkling H2Os and other watercolors, then mounted it onto some green Asian dp (by Far and Away Scrapbooks), added an Asian brad (by Where Memories Are Created) and a die-cut Chinese symbol. My "splash of red" which was demanded in the challenge is the bridge which I colored red - I call the whole card "The Red Bridge". I hope you like it - anyway, it was fun to get to know a new movie and to create this card! Wow!! This is amazing! I love the landscape, so pretty!! This is beautiful! Love the PP & the print. Thanks for the details, Take Care, Amy. We are visiting my parents right now - and have been away from home for 2 weeks now - I can't wait to catch up! You are just wonderful Christiane and I am so glad to have met you in blogland! Will write more soon! Thank you so much for playing along in the weekly Cinema Saturday Challenges!! Sending you lots of love!!! !